A slow cooker, i.e. Crockpot, is a pretty standard wedding-shower-gift idea. 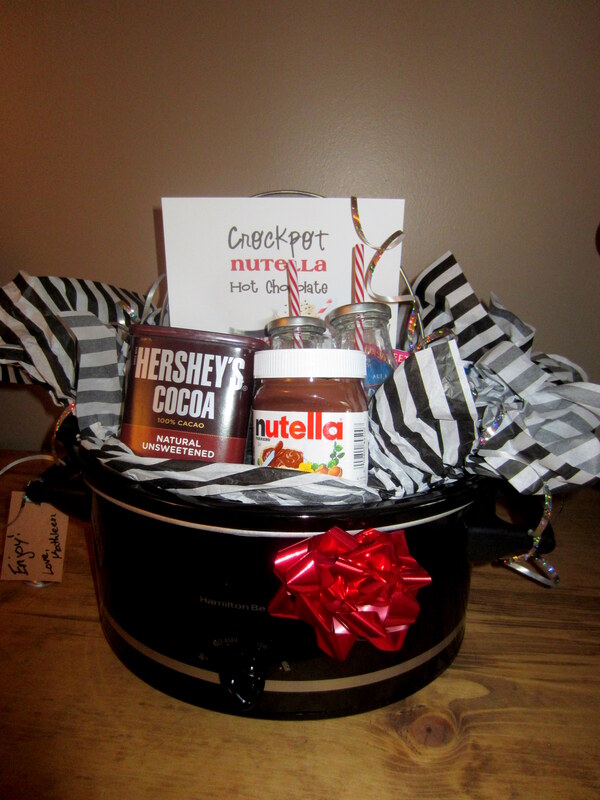 Why not jazz it up with a couple ingredients and a recipe, and basically make a gift basket out of your Crockpot? Not gonna lie, I was very happy with the end result. The gift went from something plain and typical to something exciting and Pinterest-worthy. No surprise, I meant to post this ages ago, but I’m finding that posting gets more and more difficult as the kids get older…not easier, as I was hoping. Stuff the tissue paper into the slow cooker (I used an 8-quart Hamilton Beach). Print the recipe on sturdy card stock, then prop it up with the lid. 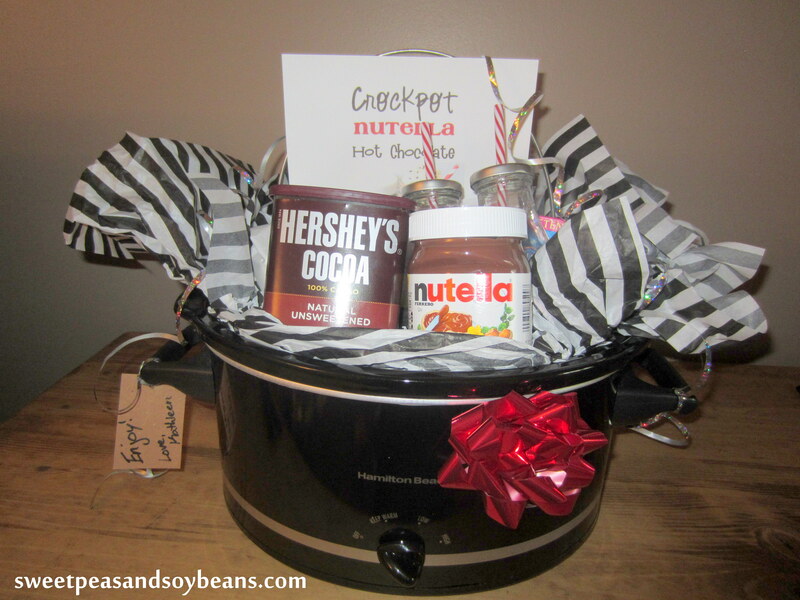 Stuff the rest of the items into the slow cooker, making sure the cocoa, nutella, and milk bottles can be seen. Tie some gift-wrap ribbon to the handles and make sure it curls quite a bit. Add a tag to a handle if you so choose. Slap a bow on the front of the pot and voila! Side note—my family is a bit lactarded, so the almond milk made sense. You could use regular milk in this recipe, but as far as the gift is concerned, shelf-stable almond milk or evaporated milk works better. In a large pan, bring cocoa, nutella, sugar, and water to a low boil, stirring constantly. Move mixture to slow cooker and stir in milk. Cook on high for 2 to 2½ hours, or on low for 4 to 4½ hours.